In the House of Lords in London, Rt. Hon. 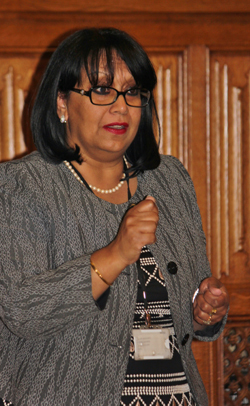 Baroness Verma light heartedly opened the evening to a room where every possible place to sit or stand was filled. Key and simple points to strive to change are the dynamics of conversation away from the struggles of women equality and start to look at the very clear benefits of having a female child in your home. Look at the benefit of giving economic independence to girls and women to be able to contribute to the wider society. What a tragedy it is that, instead of these conversations, in the UK alone, 1 in 4 women have been or are still the victims of some sort of abuse in the home because of their gender. With a collective, collaborative goal all around the world, our combined effort really can eliminate this issue for good worldwide. We have already made a lot of progress in many countries worldwide. Although we have come a long way, it puts the issue into perspective 00when we realise that 369 women have been elected into a political seat worldwide and those women currently in position are 8% of all the women there have ever been in political positions since women’s suffrage in 1918. Why is this the case? The reason that is commonly bounced around is that there is a lack of interest among the female population about politics. 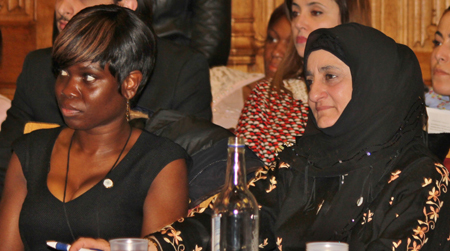 But though speaking to hundreds of politically minded women, Baroness Hussein-Ece realised that this is not the case. Even if the women and girls themselves think they have no interest, they have are invested in the constituent parts of politics, education, social issues and welfare, to name a few examples. It is not the people that block themselves but the system that puts up the barriers they face. Women are excellent at seeing what services are needed in a community and seeing where the gaps lay. A male dominated cabinet can’t always cater to the issues surrounding women, who make up over 50% of the population. How dismaying it is when we turn on newsnight and we see a full panel of only men discussing and debating maternity. "Let us first acknowledge the historic room we are in. A room which reflects the ideals of parliamentary democracy that have characterised this country and the many other countries that have followed it. If we look at the UN millennium development goals, many countries have not made the progress we have hoped for. This is not a problem unique to women’s rights but one shared with poverty, health and violence. There is a tradition in Sri Lanka that heads of government meet with an associated people’s forum that precedes. This people’s forum produces an outcome that is presented to ministers. The debates of the people will animate the government’s discussions. This format has been copied and women’s rights were at the centre of the discussion. Issues surrounding social and economic equality created a standalone goal for after 2015 to eliminate these issues and enforce sexual and reproductive rights. “speak voices, not positions”. Ms. Anjum Anwar MBE (in photo below on right) who is the Chair of Women's Voice and the Interfaith Officer for Blackburn Cathedral in this she is the only Muslim women to be employed in an Anglican cathedral to bring conversation and dialogue. "Why do we want to empower women and what is the reason we fight for the end of all the things we have discussed today? To quote Kofi Annan, “I believe that women are naturally inclined to be more compassionate.” This is not a comment of disrespect, but one celebrating diversity. Women are the givers of new life. Whilst we have come a long way, there are still women around the world who don’t have a platform, such as the one we are using now, and suffer in silence. There are hundreds of thousands in this country. How do we help these people? It is not easy to challenge your suffering if you believe that your faith and culture doesn’t allow your freedom and equality. I am not a very politically correct person and rarely get invited to the same event twice in a row, but if we are not challenging, if we don’t have those hard conversations, we can’t create any relationships of cohesion. Where do women get the idea that it is ok for their husbands to hit them? It is from educational and religious illiteracy. People put trust and faith into their religious leaders. The vast majority of these leaders are men. Women need help, not just from religious leaders, the Lords and Commons but also from the grassroots level. I am a better Muslim today than when I was working for a solely Muslim organisation. My values are clear and they demand justice. Not because women can’t speak, but there are often not the right conditions for them to be heard. We have the power to inspire change for others, but before we do that, we need to demand justice for ourselves so we can establish an overarching justice for all. I am seeing it starting here." Marsha Thompson: Youth Liaison Officer for Shout Out UK, spoke very poetically in a speech titled, “Message to Our Daughters”. "I am 22 years old and I have a 3 year old daughter. Yes, I am a young mother. Yes, I am considered by society a stereotype and YES, I hear the whispers and I feel the disapproval judgmental eyes but in the words of Maya Angelou "You may shoot me with your words, you may cut me with your eyes but still like air I'll rise!" I went to university when my daughter was 9 months old and in 2 months I will be graduating with my 3 year old. I am not just a young mother but I am a young woman, a daughter, a sister and a friend. I have ambition, dreams, direction and a future but most importantly I have a voice! There are only a few women leaders but yet we scrutinize, belittle and judge young girls forgetting that one day these young girls will grow up to become women. You are beautiful, you are strong, you are gifted and you belong. You carry the life's weight on your shoulders but still you stand strong. Don't be afraid to walk in the dark, just as long as you are following your heart, the ignorance of others won't pierce like a dart! Demand respect and take every step to become the Queens that you are! Break boundaries, go for what you want and let your voice echo for centuries. No matter your age, No matter your race, No matter your circumstances. You are beautiful, you are strong, you are gifted and YES, women you do belong"
Ms. Justina Mutale’s (in photo in middle) contribution was based on the chair of the IMF’s plan to bridge the gender gap, putting them on equal footing as men. "It was said that when Napoleon was inspired by his wife, he was irresistible and invincible. History has shown that, when great men and women come together, their greatness is multiplied. We have gender equality at the centre of the UN millennium development goals and it is the priority in the post 2015 development agenda. This year, the UN theme is equality with real progress for all. In order to aim for this we need to be creative and proactive. Although we see many inspiring gains in the realm of women’s equality, they are too few and far between. We still have a huge gap to cross and it is heart breaking that we still, after 200 years of fighting, there are still too few women who have held prominent and visible positions of power and influence. "I was asked to speak because of the research for my book that I have done in the last year about inspiring change. The book contains real raw stories where women share their vulnerabilities and triumphs. Inspiring change in women needs one fundamental component. Without encouraging and inspiring the leadership of this world and community leaders, through great media coverage and generating a lot of noise in the system, women’s issues will stay women’s issues. They should be general issues for all of us, both men and women, to be concerned about." "Even attending Oxford, the careers office gave her three recommendations as an engaged women finishing university education: Teacher, secretary or unemployed. Although she did do all these types of jobs thoughout the course of her career, there is so much more that can be done with a young woman. Women are achieving in all areas and it is now unimaginable that a woman would get that advice from the educational institutions. The City is traditionally a male dominated society and in the 800 years of the institution, this year, the second women to ever be mayor is taking that role. We shouldn’t be thinking “there have been only 2 in 800 years.” We should be thinking “wow, we have made progress; we have a woman mayor in the City”. We should know what to focus on. We will know we have got to the finish line when we can see a woman take a leading role in position and cease to remark on it."